In New Jersey, a developer may need to obtain a State Highway Erection of Pole Permit from the New Jersey Department of Transportation (NJDOT) prior to constructing a facility “over, under, or within any portion of a state highway right-of-way.” N.J. Admin. Code 16:41-1.1. The NJDOT regulates state highway right-of-way encroachments pursuant to N.J. Stat. Ann. § 27:1A-1; N.J. Admin. Code 16:41-1.1. 3-NJ-e.1 to 3-NJ-e.2 – Does the Project Involve Erection of a Utility Pole? If a predominant activity of a proposed project involves the erection of a utility pole, the developer may need to obtain a State Highway Erection of Pole Permit. State Highway Erection of Pole Erection Permits are required for “the erection, relocation, or replacement of poles, appurtenances, or other pole attachments located within any portion of State highway rights-of-way.” N.J. Admin. Code 16:41-5.2(a). Required fee amount. Application for Erection of Pole. Covering all areas where the activity is proposed showing pertinent existing highway and topographic features and all proposed activities, including installations, removals, and modifications. N.J. Admin. Code 16:41-5.6(a). 3-NJ-e.4 to 3-NJ-e.5 – Does the Developer Request a Waiver? If the developer seeks a waiver to design, fee, or permit requirements, the applicant (developer) must complete and file a Request for Waiver as an attachment to the Permit Application. N.J. Admin. Code 16:41-9.1. The Request for Waiver must state the reasons why a waiver is appropriate and include documentation to support the waiver. N.J. Admin. Code 16:41-9.1. The NJDOT Operations Permit Office reviews the Permit Application for technical and administrative completeness. The NJDOT Operations Permit Office also assesses whether the project requires permitting and whether the applicant (developer) has applied for the proper types of Permits. N.J. Admin. Code 16:41-5.1(c). The NJDOT must assess whether a Permit Application is complete within 45 days of the NJDOT’s receipt of the Application. 3-NJ-e.7 to 3-NJ-e.8 – Is the Application Complete? If the Permit Application is not complete, the NJDOT Operations Permit Office must send written notice to the applicant (developer) containing a request for specific additional information. 3-NJ-e.9– Does the Developer Respond Within 90 days? If the NJDOT requests supplemental information, then the developer must respond to the request within 90 days. If the applicant (developer) fails to respond to a request within 90 days, then the Application is considered withdrawn. N.J. Admin. Code 16:41-5.4(c). 3-NJ-e.10 to 3-NJ-e.11 – Does the NJDOT Determine That no Permit is Required? Upon reviewing the Application, NJDOT determines whether a Permit is actually necessary to complete a proposed project. If NJDOT determines that a permit is needed, the NJDOT Operations Permit Office will coordinate review of the Application with other department offices. If a Permit is not needed, the NJDOT Operations Permit Office issues a letter to the applicant (developer) that the Permit is not needed. N.J. Admin. Code 16:41-5.1(c). If a project does not require a Permit, then the applicant (developer) may continue with the proposed project in compliance with all other state regulations and local requirements. The NJDOT will not consider a Permit Application to have been submitted and will not begin processing a Permit Application until the applicant (developer) has paid all required fees. N.J. Admin. Code 16:41-5.1(d). For information about permit-specific application fees see N.J. Admin. Code 16:41-8.1(c). In addition to submitting a complete Permit Application, an applicant (developer) must also complete and submit a Power of Attorney Form to NJDOT. The NJDOT assesses the Permit Application for approval. NJDOT must either approve or deny the Permit Application within 45 days. N.J. Admin. Code 16:41-5.4(a). Note: The NJDOT may extend the review period for Permit Applications for longitudinal installations of private facilities over 660 feet long and for longitudinal installations of underground fiber optic facilities over 1,320 feet long. N.J. Admin. Code 16:41-5.4. 3-NJ-e.15 – Does the NJDOT Approve the Permit? The NJDOT must “not authorize activity within the limits of State highway rights-of-way….that would adversely affect the stability, appearance, or designed function of the State highway itself or of its component or auxiliary structures.” N.J. Admin. Code 16:41-3.1. If the NJDOT denies the Application, proceed to 3-NJ-c.24. If the NJDOT Operations Permit Office approves the Permit Application, the NJDOT Operations Permit Office must send a proposed permit to the applicant (developer). N.J. Admin. Code 16:41-5.6. 3-NJ-e.17 – Does the Developer Sign and Return the Proposed Permit Within 30 Days? If the applicant (developer) does not return the signed proposed permit and the permit fee to the NJDOT Operation Permit Office within 30 of the NJDOT’s transmittal to the applicant (developer) then the NJDOT will consider the Permit Application withdrawn. N.J. Admin. Code 16:41-5.6. If the applicant (developer) returns the permit fee and the signed proposed permit within 30 days, then the NJDOT must execute the Approved Permit within 10 (ten) days of receipt. N.J. Admin. Code 16:41-6.1(f). At least one week before starting the activity, the developer must send a letter specifying the starting date of the proposed project and a copy of the Permit to the municipal clerk in each municipality where the permit authorizes activity. N.J. Admin. Code 16:41-6.2. If the applicant (developer) was granted a waiver, then the NJDOT must incorporate the waiver into the conditions of the permit. N.J. Admin. Code 16:41-6.9(c). There are various permit conditions depending on the predominant activity associated with the permit. For information about activity-specific permit conditions see N.J. Admin. Code 16:41-6.3. 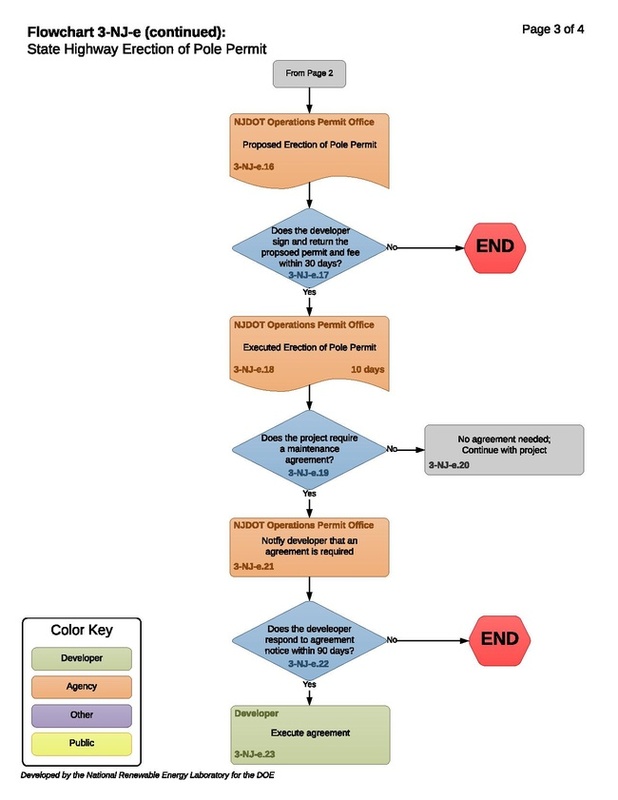 3-NJ-e.19 to 3-NJ-e.20 – Does the Project Require a Maintenance Agreement? Pursuant to N.J. Admin. Code 16:41-6.6(a) the NJDOT may require the developer to execute an agreement as a condition of a State Highway Erection of Pole Permit. Generally, the NJDOT requires a maintenance agreement for activities resulting in the installation or modification of permanent facilities within a state highway right-of-way. N.J. Admin. Code 16:41-6.6(a)(2). Utility companies must execute a maintenance agreement as a condition of a permit. N.J. Admin. Code 16:41-6.6(b). If an agreement is required, the NJDOT Operations Permit Office must notify the applicant (developer). If an agreement is required, then execution of the agreement is a required condition of the permit. N.J. Admin. Code 16:41-6.6(c). The applicant (developer) must respond to the NJDOT’s correspondence regarding the agreement within 90 days of NJDOT issuing the correspondence. If the applicant (developer) fails to respond to the NJDOT’s correspondence within the prescribed time period, then the NJDOT deems the application withdrawn. N.J. Admin. Code 16:41-6.6(c). A maintenance agreement for activities resulting from the installation or modification of permanent facilities within the state highway right-of-way. N.J. Admin. Code 16:41-6.6(b). If the NJDOT denies the Permit Application, the NJDOT Operations Permit Office must send the applicant (developer) a letter stating the reasons for the denial referring to the design standards supporting the denial. N.J. Admin. Code 16:41-5.5. The applicant (developer) must submit a written request for reconsideration to the NJDOT Operations Permit Office within 30 days of receiving notice of the NJDOT’s decision on the Permit Application. N.J. Admin. Code 16:41-6.11(a). The request must include reasons for the request. N.J. Admin. Code 16:41-6.11(a). 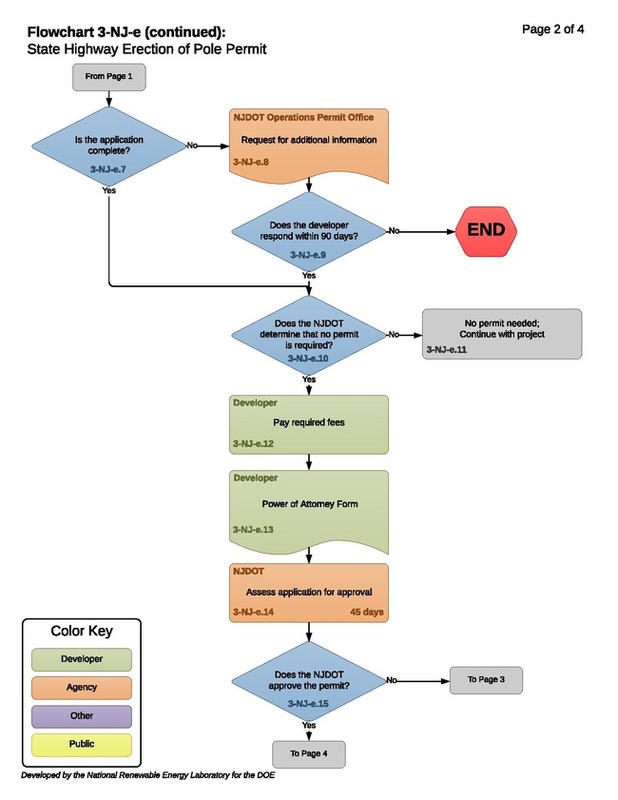 The NJDOT Operations Permit Office must schedule a meeting with the requester (developer) within 10 (ten) days of receipt of the reconsideration request. N.J. Admin. Code 16:41-6.11(a). This meeting must take place within 30 days after the NJDOT Operations Permit Office’s scheduling the meeting. The NJDOT Operations Permit Office must make a decision in writing on the request for reconsideration within 15 days of holding the meeting. 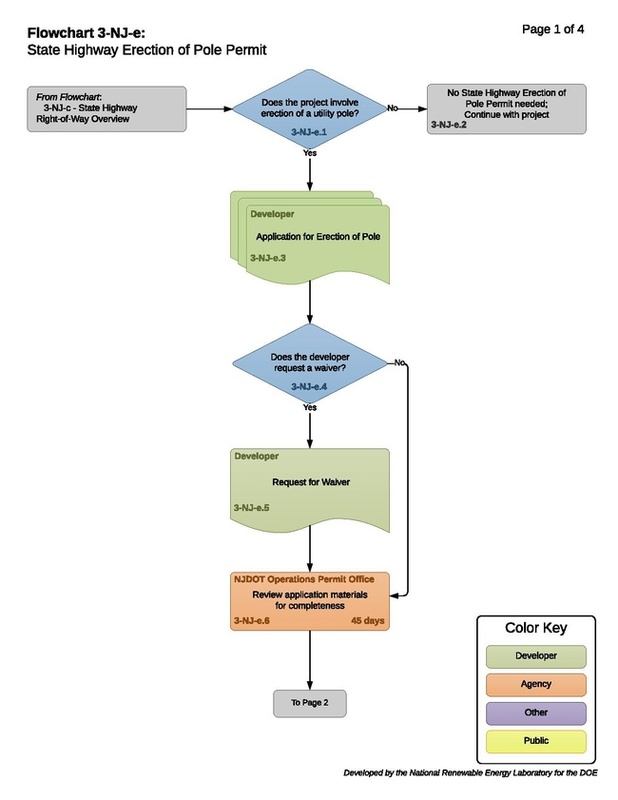 The NJDOT Operations Permit Office must notify the requester (developer) of its decision. N.J. Admin. Code 16:41-6.11(a). If the decision is not favorable to the requester (developer) then the developer may submit a further appeal to the NJDOT Director of Operations Support within 15 days of receiving the decision on the request for consideration. N.J. Admin. Code 16:41-6.11(a). 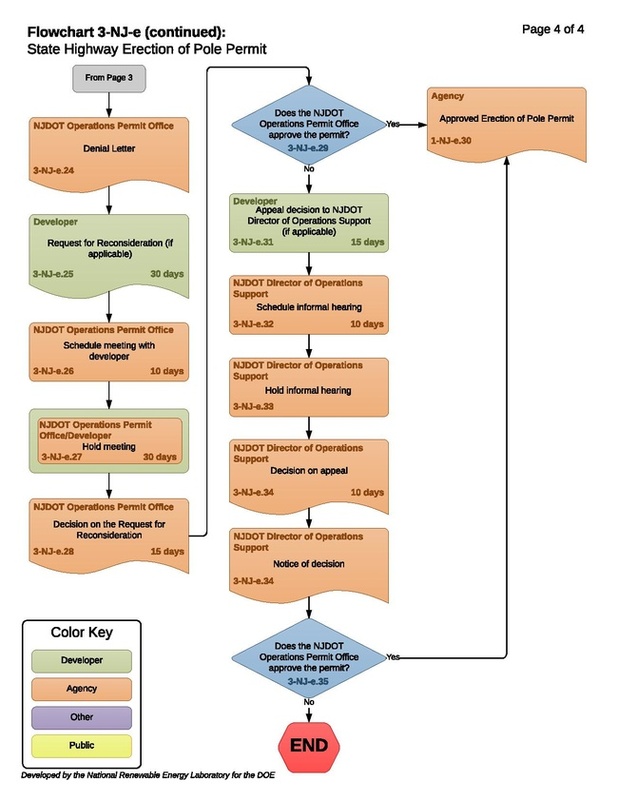 If the appellant (developer) submits a further appeal to the NJDOT Director of Operations Support then the NJDOT Director of Operations Support must schedule an informal hearing within 10 (ten) days of receiving the appeal and conduct a hearing. N.J. Admin. Code 16:41-6.11(a). The appellant (developer) has an opportunity to present additional information at the informal hearing. N.J. Admin. Code 16:41-6.11(a). In holding an informal hearing on the Permit Application on appeal, the NJDOT Director of Operations Support considers the public’s right and interest in a safe and efficient highway system. N.J. Admin. Code 16:41-6.11(a). The NJDOT Director of Operations Support must issue the final agency decision on the appeal, stating the reasoning for the decision, within 10 (ten) days of the informal hearing. The NJDOT Director of Operations Support must notify the appellant (developer) in writing of the decision. N.J. Admin. Code 16:41-6.11(a). This page was last modified on 24 August 2018, at 12:40.